Weekly Winner: My First Foray into Farro … Fabulous! Tis the season. What season you ask? Marathon training season. Oh good God, not for me! But for several of the clients that I am currently cooking for. Now, while that means different things to different people, what it means for my clients is that they are looking for healthy, filling (but not heavy) recipes to power them through the added mileage they will be putting in. Some want carbs, some do not — but all want seriously healthy, tasty food. Of course kale is popular as is quinoa. I’ve made more quinoa in the last few months than I ever thought I’d make in a lifetime. I’ve gained a new-found appreciation for the ancient grain. It’s basically a blank canvas. But I digress. This entry is not about quinoa but about farro. One of my clients asked if I did much with it and I had to admit that I did not. But that made me curious. Then Martha came to the rescue. Martha Stewart that is. Not her personally, but her magazine Martha Stewart Living. It was there that I found this recipe for Kale and Farro Salad with Feta. When I found myself with a free afternoon on the same day that my favorite Green City Market was going on, I knew what I had to do. Test the recipe! All for myself. Dang it was tasty. Really quite extraordinarily good. The farro was wonderfully toothsome and nutty. All around an incredibly satisfying dish and one that you just couldn’t help but feel good about eating. I immediately put it on my marathoners’ menus and have a feeling I’ll be making a lot of this salad in the coming months. And don’t worry — I’m proof that you don’t need to be a marathoner (or even a runner) to enjoy this recipe. Cover farro with 3 inches of water in a medium saucepan. Bring to a boil, then reduce heat to a simmer and cook, uncovered, until grains are tender, 30 to 35 minutes. Drain and let cool completely. 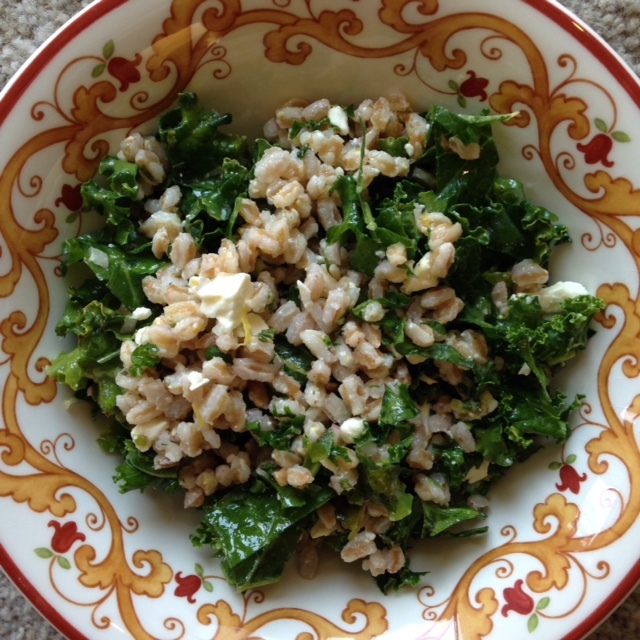 Transfer farro to a large bowl and add kale, onion, sliced mint, lemon zest and juice, and oil. Toss until farro is well coated. Season with salt and pepper, then sprinkle with feta. Let stand 30 minutes before serving, topped with small mint leaves. Salad can be stored in refrigerator up to 2 days. Zucchini gets a bad rap. It’s maligned, it’s looked down upon, and whenever possible, cast aside. And that’s a shame. I admit that by itself it is not terribly glamorous. While I enjoy it raw with dips or sautéed as a side, it generally is not something I crave. But whenever I have it, I think to myself “Why don’t people just give zucchini a chance?” I think, like anything or anyone, with the right preparation and make-up, it can be a real stunner. 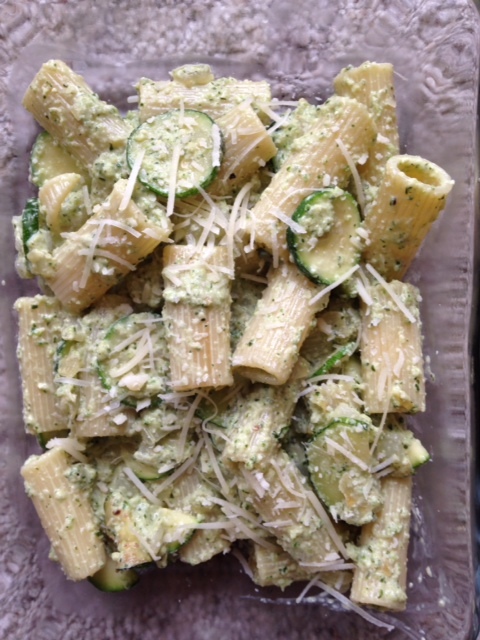 Case in point – Pasta with Zucchini Pistou. This dish is luscious. It is decadent. It is even elegant. Things that are never associated with the lowly zucchini. I got the recipe ages ago in Cooking Light Magazine and as soon as the weather warms up, I find myself searching for it again. So as the farmer’s markets and well-meaning friends start pushing their zucchini at you, don’t look the other way. Grab them and make this pasta. You’ll be so glad you did. I have always thought Spring is highly overrated. Not the season itself, mind you. I’m all for renewal and pretty flowers and you need something to take you from winter to summer. It’s the weather I hate. Especially here in Chicago. It’s cold. It’s rainy. It’s windy — incredibly windy. All in all it is terribly over-hyped. This spring is no exception. I had the air conditioning on over the weekend and I am quite tempted to turn the furnace back on today! Simply Crazy. Having said all that, what is one to eat? The wonderful spring produce is starting to show up, but a salad just doesn’t seem right on blustery, rainy spring days. This soup is the perfect compromise. It is warm and soothing, but chock full of fresh, crunchy spring veggies. The touch of cream along with the pappardelle pasta adds a velvety touch. All in all a really great soup. The recipe comes from Sunset magazine and will do nicely until this city’s weather decides what it wants to do. Bring 6 ½ cups broth to a simmer in a medium pot over high heat. Add chicken, cover, and reduce heat to maintain a very gentle simmer. Poach until chicken is cooked through, 25-30 minutes. Transfer chicken to a plate; let cool slightly. Add green onions and carrots to broth, increase heat to medium, and simmer until green onions are just tender, 4 to 5 minutes. Add pasta and simmer until just tender, 6 to 8 minutes. Meanwhile, shred chicken from bones. 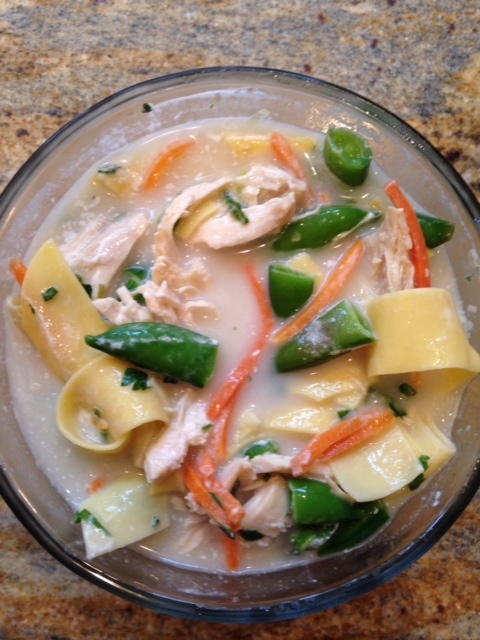 Stir chicken, cream, snap peas, parsley, salt and pepper into soup. Remove from heat and let stand a couple of minutes until snap peas are bright green. Add more broth if needed. Stir in tarragon and ladle into bowls.